Stamp collectors are of course often interested in stamps designed for airmail and early flown covers. Some specialise in collecting Zeppelin issues too. But one lot which went under the hammer at a German stamp specialist last week was a little different. 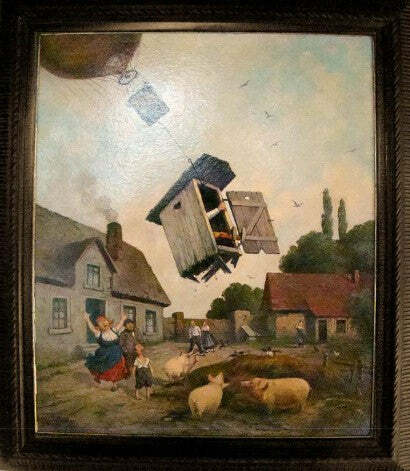 The gargantuan four day auction had a short (four lot) 'balloon-themed' section, in which the most important lot had very little to do with philately at all. 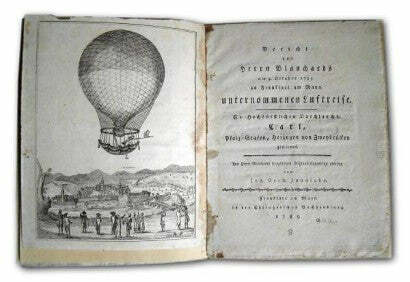 This was the Collection of Dr. Alexander Schubert entitled Lighter Than Air - Balloon Ride or history of the realisation of an ancient human dream of flying. Schubert was a balloon pilot and enthusiastic collector spent his life putting together an extraordinary hoard of 3,000 non-philatelic individual objects. The museum-grade collection might be the world's largest in private hands. Many of the items were exhibited in 1983, as this was the 200th anniversary of the Montgolfier brothers first ascent in 1783. The Westphalian State Museum for Art and Cultural History in Muenster organised the exhibition. One focus of the collection is the 1,000 paintings, drawings, prints and cartoons, including 13 original paintings by Hector Trotin, Gaston Tissander, a copper engraving by Lana balloon in 1784. Ballooning is often a rather unsung area in the history of aviation, but of course it was the first way that man left terra firma behind, and balloons were put to many uses. We've previously covered the sale of books relating to S A Andree, who attempted to fly over the North Pole in a balloon. It was only the challenge of developing flight in 'heavier than air machines' which later eclipsed the balloonist's history. Charles Rolls - the co-founder of Rolls-Royce whose extraordinary collection of Wright Brothers photographs we're proudly offering for sale at the moment - was initially taken with ballooning. The feel of the Schubert collection is celebratory as much as historical, however, and there are various items such as antique clocks themed on balloons. The whole lot sold for €455,000 in the Christoph Gartner sale.